It may be a bye week, but we live in Seattle dammit and it’s time to do a Seahawks themed strain because, y’know… go Hawks, and “why not you”, and – yeah. So break out your blue/green attire, and dig the sativa hybrid known as 12th Man Down. Made by Phat Panda, we picked up an eighth at Bellevue’s Green-Theory for $39 (a smokin’ deal). Coincidentally, I had chosen to visit the shop during a “flash sale” (only lasting 3-4 hours, often only publicized on social media), and the budtender (Gilly) strongly recommend the specific strain on sale. According to Gilly, the strain was basically Girl Scout Cookies – but renamed. Being a big fan of Cookies, I was intrigued and wanted to take on this Hawks themed iteration. 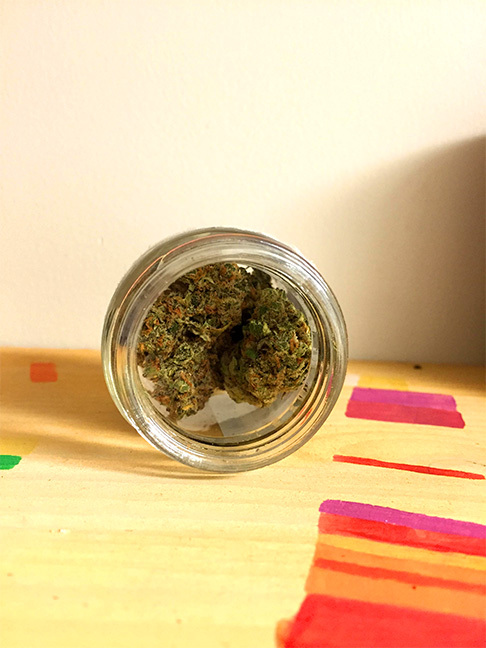 Phat Panda is based out of Spokane, and they have a wide selection of strains available. 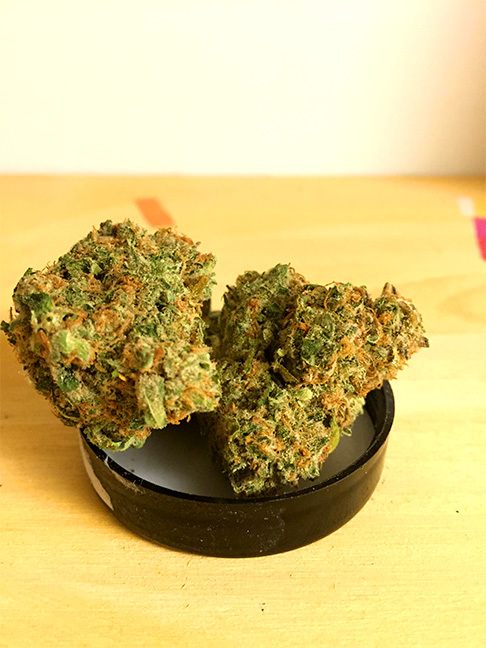 I would consider their products on the “higher end” of the recreational market, usually costing upwards of $50-$60 for an eighth – still the potency is there, and they haven’t let me down yet. Launch Point: Three to five minutes after smoking. 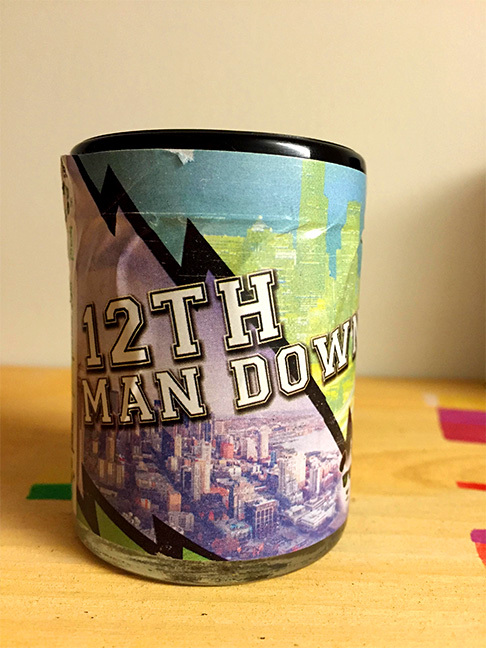 According to the budtender, 12th Man Down is Thin Mints – which is actually Girl Scout Cookies (I touched on this in the intro). Basically this strain is beloved for it’s ability to give relaxing vibes yet not sedate heavily, and it’s powerful head high. 12th Man Down is highly crystallized. The color is like a light green, seemingly glowing under the bright lights. The buds were crisp and burnt well after being ground up. After snapping a bud apart, it was apparent there was a pine-sol like aroma in the room. That strange combination of synthetic floor cleaner (all purpose?) and earthy soil smell, it’s one of my favorites. The taste was notably gasoline-y (or rubbery, depending on your taste buds). Still good, though! Okay so I’ve been on what we call a “bender” for a few weeks (thank you fresh hop season), and as a result I’ve been looking for strains that provide me with the strength to press on. 12th Man Down may sound like a songfest – but it brings you “up”, despite the name. There was mild sedation with the strain, though that’s to be expected. Some times we all just need to remember that life’s too short to smoke bad weed. If this strain seems like your kind of ticket, then you can find Phat Panda products at Green-Theory, and probably at your favorite pot shop. Fischer Campbell is a marijuana review writer for High Above Seattle. His sole purpose and quest is to seek out the perfect strain of local cannabis and follow it up with the perfect weed review.